The prevalence of gestational diabetes mellitus (GDM) has tremendously increased in the past few years, especially in the developing countries like India., As per the Americans with Disabilities Act (ADA) guidelines, it is defined as any degree of glucose intolerance which is identified in the second or third trimester of pregnancy and is not clearly either pre-existing type 1 or type 2 diabetes. It has implications for the mother and the foetus both. Maternal complications such as pre-eclampsia, stillbirths, macrosomia and need for caesarean section and neonatal outcomes such as hypoglycaemia and respiratory distress are few to name., There is an increased risk of developing type 2 diabetes in females who had GDM in previous pregnancy. Interestingly, data also suggest that children of mothers who had diabetes in pregnancy are at higher risk of developing diabetes later in life as compared to their siblings born to the same parents in a non-GDM pregnancy. Indian women have 11 times more risk of developing GDM as compared to women in other parts of the world. The prevalence of GDM in India varies in different regions with a reported prevalence of 3.8% in Kashmir, 9.5% in Western India, 6.2% in Mysore and 22% in Tamil Nadu. Differences in the prevalence rates across India could be attributed to differences in age, body mass index (BMI), socioeconomic status of females and cultural differences as well. Different screening and diagnostic criteria could also be responsible for different prevalence rates. The objective of this study was to estimate the general prevalence of GDM among women attending a tertiary care centre in Delhi and compare it with the prevalence in Muzaffarpur (Bihar) and Bhilai (Chhattisgarh). It was a pilot study to assess the prevalence in these three regions of North India. This pilot prospective cross-sectional study was conducted at three centres of North India with a base at Max Super Speciality Hospital, Saket, New Delhi, over a period of 10 months (December 2015–October 2016). Pregnant females attending gynaecology clinic of Max Super Speciality Hospital, Saket, Aayushman Hospital, Muzaffarpur and the Srijjan Bhilai Test Tube Baby Centre, Bhilai, were screened and enrolled, after taking their informed consent. We enrolled all females diagnosed with GDM in the second or third trimester, as per the ADA criteria. Screening criteria for GDM followed at the three centres were different. The criteria used were those being followed in their routine practice. There were also certain logistic difficulties due to which we could not use uniform criteria for screening. In Delhi, 75 g oral glucose challenge test was followed; in Bhilai, sample 1 h after 75 g glucose challenge was taken and in Muzaffarpur, fasting blood sample was taken. Women who were already diagnosed with diabetes were excluded from the study. Demographic and social history of all females was recorded in paper-based case-report forms. Medical records were reviewed for recent haemoglobin levels, fasting blood sugar levels (FBS) and other clinical parameters. This study was approved by the Scientific and Institutional Ethics Committees of Max Super Speciality Hospital, Saket, New Delhi. Written informed consent was taken from all the participants and only those women who elected to participate were enrolled into the study. The Statistical Package for Social Sciences (SPSS) version 16.0 (SPSS Inc. 2007) was used to analyse the data. Mean of FBS, age, height, pre-pregnancy weight, BMI, blood pressure (systolic and diastolic), post-prandial blood sugar, total leucocyte count, platelet and thyroid-stimulating hormone was calculated using independent Student t-test. The prevalence of GDM in the three regions was estimated using the Chi-square test. Association of the presence of GDM with its risk factors such as age, pre-pregnancy BMI, the presence of hypothyroidism and a family history of diabetes was also calculated by the Chi-square test. P < 0.05 was considered statistically significant. Logistic regression analysis was performed to find the odds ration of the risk factors of GDM in our population subset. A total of 230 women were enrolled into the study, of which 100 were recruited from Delhi, 65 from Muzaffarpur and 65 from the Bhilai centre. The mean age of our study population was 28.31 ± 4.79 years. Demographic and clinical details of women recruited in the three regions are summarised in [Table 1]. Average week of gestation was 27.89 ± 5.97. The prevalence rate of GDM in Delhi was found to be 14% (14/100), in Bhilai, it was 10.77% (7/65) and lowest in Muzaffarpur, 3.07% (2/65) P = 0.044, with an overall prevalence of 10% [Figure 1]. A significant difference (P < 0.01) was observed in the mean age and BMI of participants at Bhilai, Muzaffarpur and Delhi, 32.86 ± 4.88 years, 28.15 ± 3.68 kg/m2; 32.00 ± 5.66 years, 27.68 ± 3.24 kg/m2 and 31.93 ± 3.38 years, 23.89 ± 4.89 kg/m2, respectively [Table 2]. 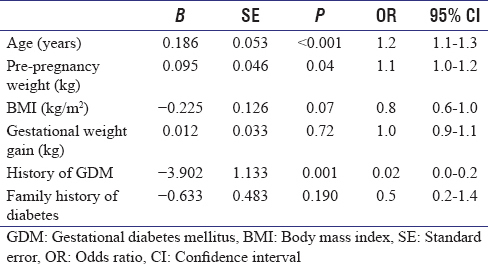 Logistic regression analysis showed that age and pre-pregnancy BMI were significantly associated with the presence of GDM [Table 3]. The prevalence rate increased with increasing educational qualification of females, with highest being in women who were post-graduates or above (17.14%, 12/70) followed by undergraduates (10.67%, 8/75) and those with secondary (2.13%, 1/47) or primary education (3.57%, 1/28). This observation was found to be statistically significant (P = 0.016). Majority (17/23) of the females diagnosed with GDM were in the age group 26–35 years. The presence of GDM was associated with increasing age (P < 0.01), family history of diabetes (P = 0.05), with 52.17% (12/23) females having a family history of diabetes. Hypothyroidism also showed an association with GDM (P < 0.01) 43.48% (10/23) of the females diagnosed with GDM had hypothyroidism. The prevalence of GDM is increasing at an alarming rate in India, with a reported prevalence of 2% in the 1980s and 16.55% in 2000., The prevalence has been shown to be higher in urban India as compared to the rural parts. There is a large regional disparity in the prevalence of diabetes in India, and it is similar for GDM as well., Varying degree of prevalence rates has been reported in different parts of the country such as 3.8% in Kashmir, 17.8% in Tamil Nadu and 7.7% in Maharashtra. A survey performed in different cities of India in the year 2002–2003 has found a prevalence of 16.2% in Chennai, 15% in Thiruvananthapuram, 17.5% in Ludhiana, 12% in Bangalore and 21% in Alwaye. This varying prevalence rates reflect a true variation throughout the subcontinent. This variation could be attributed to the difference in geographical conditions, dietary habits and socio-economic status. It is also largely influenced by the criteria used for screening and diagnosis. Our group has earlier reported that using the International Association of Diabetes and Pregnancy Study Groups guidelines, more number of females could be diagnosed with GDM as it is more precise and effective. This difference in the prevalence rates makes it more important to have data from other parts across India. Bhilai is considered to be the industrial state of India and Muzaffarpur population comes under the bracket of rural India. These two regions are the least explored in terms of the prevalence of GDM as well as diabetes. There are no data available on the prevalence of GDM from these two regions. We, therefore, decided to conduct a pilot study in these parts of India to estimate the prevalence of GDM. Delhi was included in this study to have a heterogeneous population subset. We found the prevalence of GDM in Delhi was 14% (14/100), in Bhilai, it was 10.77% (7/65) and lowest in Muzaffarpur, 3.07% (2/65). None of the females were a known case of diabetes. In Bhilai, as the study was done in an IVF centre, the patients were mostly high risk, stressed, aged and had bad obstetric history, which might be one of the reasons of high prevalence in Bhilai. Although age and pre-pregnancy BMI of females recruited in Delhi were lower as compared to those at Bhilai and Muzaffarpur (P < 0.01), the prevalence of GDM was highest here. This could also be attributed to the fact that Delhi includes a mixed population and also there was a difference in sample size. 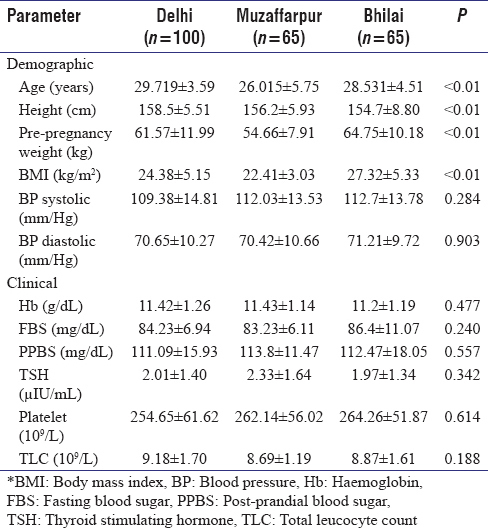 Age and pre-pregnancy BMI have shown association with the presence of GDM. In our study, the prevalence rate increased (P = 0.016) with increasing educational level. Similar results were reported by Rajput et al. in a study conducted at a tertiary care hospital of Haryana. However, an inverse association between the educational level of female and GDM was observed by Innes et al., and Yang et al. did not find any association between education and GDM in Chinese women. GDM has shown strong association with increasing age in several studies.,,,, We also observed a strong association with increasing age of females (P < 0.01) in our study. Obesity is an important risk factor of GDM. Unlike other studies, we did not find any such association in our study population., Another important risk factor includes a family history of diabetes, and clinical studies have reported an increased risk of developing GDM in females with a family history of diabetes.,,, In similar lines, a high percentage of females in our study (52.17%) had a positive family history of diabetes. A recent meta-analysis has shown significant associations between hypothyroidism and risk of GDM. We have also observed similar results (P < 0.01) with 43.48% of females diagnosed with GDM, having hypothyroidism. There are, however, few limitations of this study. Since this study was conducted at a tertiary care centre of Delhi, we could get a fraction of the population only. More large-scale population studies are required to be conducted in these regions of India to estimate the actual prevalence rate. Furthermore, since it was just a pilot study, we could get a small sample size from Bhilai and Muzaffarpur. Due to logistic difficulties in Bhilai and Muzaffarpur, screening criteria were not the same at these two centres. This issue will be addressed in subsequent studies. From the present study, we conclude that different geographical regions of India might have different prevalence rates of gestational diabetes, depending on the geographical variations, anthropometric differences and different screening and diagnostic criteria used. Our pilot study has shown that prevalence of GDM is quite high in the industrial town (Bhilai) as compared to the rural town of Bihar (Muzaffarpur) and at a tertiary care centre of Delhi. 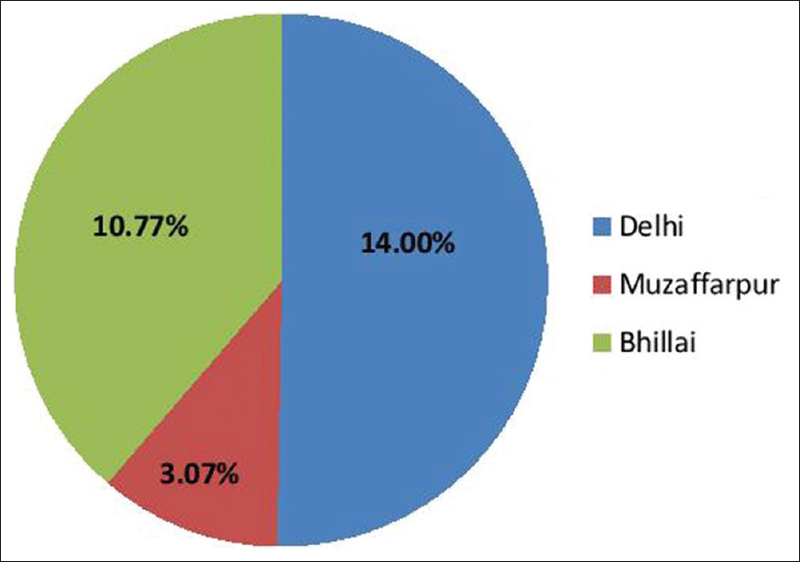 Bhilai and Muzaffarpur are the two regions in India which had no previous data on the prevalence of GDM. To the best of our knowledge, this is the first attempt of finding the prevalence of GDM in these two regions. Larger studies with uniform screening criteria are required to be done at these regions. Clinicians need to be more stringent on screening all females for GDM in these parts of India as well. International Diabetes Federation. IDF Diabetes Atlas. 7th ed. Brussels, Belgium: International Diabetes Federation; 2017. American Diabetes Association. Standards of medical care in diabetes – 2017. Diabetes Care 2017;40:S1-135. Mithal A, Bansal B, Kalra S. Gestational diabetes in India: Science and society. Indian J Endocrinol Metab 2015;19:701-4. Choudhary N, Rasheed M, Aggarwal V. Prevalence of gestational diabetes mellitus, maternal and neonatal outcomes in a peripheral hospital in North India. Int J Res Med Sci 2017;5:2343-5. Bellamy L, Casas JP, Hingorani AD, Williams D. Type 2 diabetes mellitus after gestational diabetes: A systematic review and meta-analysis. Lancet 2009;373:1773-9. Damm P. Future risk of diabetes in mother and child after gestational diabetes mellitus. Int J Gynaecol Obstet 2009;104 Suppl 1:S25-6. Sreekanthan K, Belicita A, Rajendran K, Vijayakumar A. Prevalence of gestational diabetes mellitus in a medical college in South India : A pilot study. Indian J Clin Pract 2014;25:342-7. Raja M, Baba T, Hanga A, Bilquees S, Rasheed S, Haq I, et al. A study to estimate the prevalence of gestational diabetes mellites in an urban block of Kashmir valley (North India). Int J Med Sci Public Health 2014;3:191. Bhatt AA, Dhore PB, Purandare VB, Sayyad MG, Mandal MK, Unnikrishnan AG, et al. Gestational diabetes mellitus in rural population of Western India – Results of a community survey. Indian J Endocrinol Metab 2015;19:507-10. Swami SR, Mehetre R, Shivane V, Bandgar TR, Menon PS, Shah NS, et al. Prevalence of carbohydrate intolerance of varying degrees in pregnant females in Western India (Maharashtra) – a hospital-based study. J Indian Med Assoc 2008;106:712-4, 735. Mahalakshmi MM, Bhavadharini B, Maheswari K, Kalaiyarasi G, Anjana RM, Ranjit U, et al. Comparison of maternal and fetal outcomes among Asian Indian pregnant women with or without gestational diabetes mellitus: A situational analysis study (WINGS-3). Indian J Endocrinol Metab 2016;20:491-6. American Diabetes Association. Classification and diagnosis of diabetes. Sec 2. In standards of medical care in diabetes-2016. Diabetes care 2016;39(Suppl 1):S13-S22. Diabetes Care 2016;39:1653. Agarwal S, Gupta AN. Gestational diabetes. J Assoc Physicians India 1982;30:203-5. Seshiah V, Balaji V, Balaji MS, Sanjeevi CB, Green A. Gestational diabetes mellitus in India. J Assoc Physicians India 2004;52:707-11. Seshiah V, Balaji V, Balaji MS, Paneerselvam A, Kapur A. Pregnancy and diabetes scenario around the World: India. Int J Gynaecol Obstet 2009;104 Suppl 1:S35-8. Gupta R, Misra A. Review: Type 2 diabetes in India: Regional disparities. Br J Diabetes Vasc Dis 2007;7:12-6. Mohan V, Pradeepa R. Epidemiology of diabetes in different regions of India. Health Adm 2009;22:1-18. Zargar AH, Sheikh MI, Bashir MI, Masoodi SR, Laway BA, Wani AI, et al. Prevalence of gestational diabetes mellitus in Kashmiri women from the Indian subcontinent. Diabetes Res Clin Pract 2004;66:139-45. Seshiah V, Balaji V, Balaji MS, Paneerselvam A, Arthi T, Thamizharasi M, et al. Prevalence of gestational diabetes mellitus in South India (Tamil nadu) – a community based study. J Assoc Physicians India 2008;56:329-33. Vij P, Jha S, Gupta SK, Aneja A, Mathur R, Waghdhare S, et al. Comparison of DIPSI and IADPSG criteria for diagnosis of GDM: A study in a North Indian tertiary care center. Int J Diabetes Dev Ctries 2015;35:285-8. Rajput R, Yadav Y, Nanda S, Rajput M. Prevalence of gestational diabetes mellitus and associated risk factors at a tertiary care hospital in Haryana. Indian J Med Res 2013;137:728-33. Innes KE, Byers TE, Marshall JA, Barón A, Orleans M, Hamman RF, et al. Association of a woman's own birth weight with subsequent risk for gestational diabetes. JAMA 2002;287:2534-41. Yang X, Hsu-Hage B, Zhang H, Yu L, Dong L, Li J, et al. Gestational diabetes mellitus in women of single gravidity in Tianjin city, China. Diabetes Care 2002;25:847-51. Torloni MR, Betrán AP, Horta BL, Nakamura MU, Atallah AN, Moron AF, et al. Prepregnancy BMI and the risk of gestational diabetes: A systematic review of the literature with meta-analysis. Obes Rev 2009;10:194-203. Xiong X, Saunders LD, Wang FL, Demianczuk NN. Gestational diabetes mellitus: Prevalence, risk factors, maternal and infant outcomes. Int J Gynaecol Obstet 2001;75:221-8. Kim C, Liu T, Valdez R, Beckles GL. Does frank diabetes in first-degree relatives of a pregnant woman affect the likelihood of her developing gestational diabetes mellitus or nongestational diabetes? Am J Obstet Gynecol 2009;201:576.e1-6. Gong LL, Liu H, Liu LH. Relationship between hypothyroidism and the incidence of gestational diabetes: A meta-analysis. Taiwan J Obstet Gynecol 2016;55:171-5.